It’s rare that I can mark my birthday, because it is in October. Once the summer holidays are over, managers recruit contractors in September. So as a rule, I have just started a contract when my birthday comes round. So, “big birthday” or not, it goes unmarked. 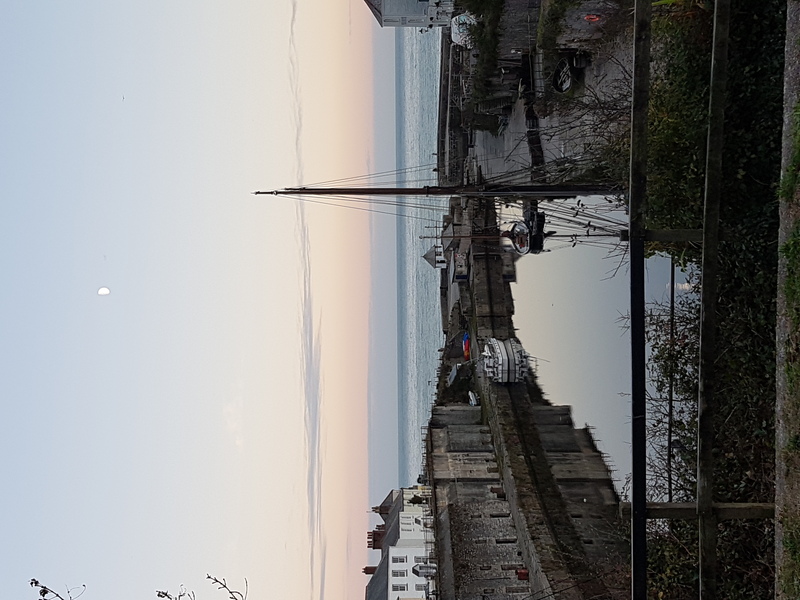 However this year I am still at home, so I went down to St Austell in Cornwall for a few days. I was fortunate to have exceedingly good weather. Each day I went down to the little port of Charlestown. Let me inflict a couple of holiday photographs on you, before I move on to matter of more general interest. 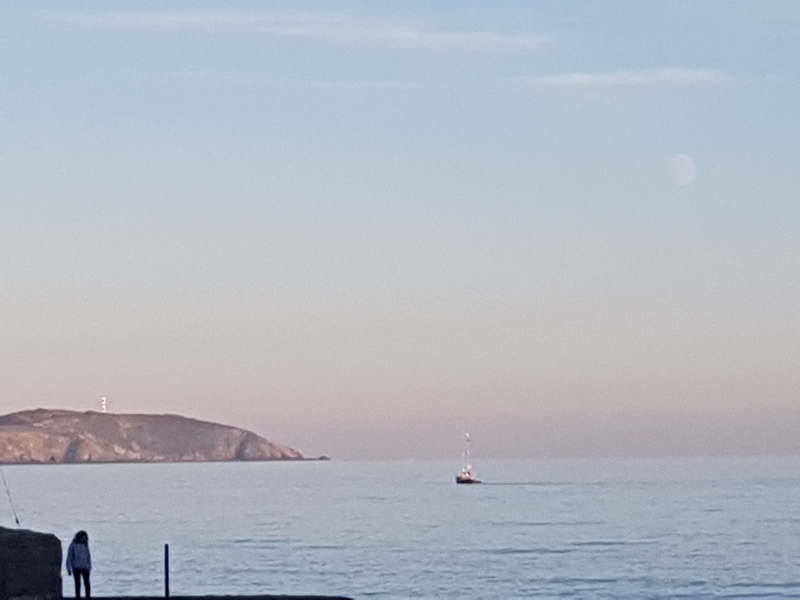 The setting sun glitters on the masts of the yacht, and on the lighthouse on Gribben Head, as a huge moon fades into view at the top right. Back I came yesterday, and unfortunately I had to spend a few hours at the end of a 350 mile journey in writing a sample coding exercise for a company that I have applied to. Such exercises can consume a lot of applicants’ time, but cost the company nothing, so I usually avoid them. But this role is very close to home, so worth it. A splitting headache today is reminding me of the price for not resting on Sunday. I spent some of the time in the hotel searching the web for material related to Ephraem Graecus and Ephraim Latinus. Some of this was quite productive. I need to download all of this, and digest it into my notes. This raises the question of how best to proceed. In one way it would be best to update my existing post on Ephraim Graecus, as I get more information. In another this might become very long. The alternative is to scatter the data across a series of posts as I read it, which is messy for those who come looking for it. Possibly I should create a page on this blog about Ephraim Graecus, and then blog my progress, updating the page and using the blog posts as announcements, as it were. I’m not sure. Ephraim Latinus is still on my mind, and indeed the focus for all this work. While I was away, the Ice/Demy (eds) volume When the Trumpet Sounds appeared. Or, rather, I found it lying behind my back gate on the concrete, where the Yodel delivery man had thrown it. This inaccessible volume contains an article with the publication of the English translation of Ephraem Latinus, De fine mundi. I shall scan the article and place it here somewhere. Incidentally isn’t it curious that an poor-quality delivery firm should name itself after a high-pitched ullulating scream? More or less the same sound, in fact, that its customers make after discovering to their horror that the vendor has chosen to send their goods by Yodel? I’m finding that early editions of Ephraim Graecus are not online – the Thwaites edition in particular. A couple of studies are in dissertations which do not seem to be online. For one of these I wrote to the author, but no answer. These ought to be obtained. There is also a 7 volume edition of the Greek text, printed from Assemani, with modern Greek translation. I have yet to find any sign of this either. So there is quite a bit to do. But not today! Caspari’s Latin text of De fine mundi (https://archive.org/details/briefeabhandlung00caspuoft/page/210) says this in section 2: “Quid ergo non proicimus a nobis omnem actuum terrenorum [sollicitudinem] et nosmet ipsos praeparamus in occursum domini Christi, ut nos eruat a confusione, quae uniuersum obruet mundum? [He then explains that the Lord’s return impends.] Omnes enim sancti et electi Dei ante tribulationem, quae uentura est, colliguntur et ad Dominum adsumuntur, ne quando uideant confusionem, quae uniuersum propter peccata nostra obruet mundum. (I’m inferring that square brackets mark Caspari’s own additions, rather than deletions). The state of the text seems far from straightforward, to judge from the many notes; Caspari’s discussion (p. 447) quotes an original in two texts of Ephraem Graecus (more on this below). The author implies later (end of 4) that there will be Christians around to be left unburied on the eve of the fall of the Roman Empire and the dragon’s rise, and says that (8) during the first half (perhaps I misread?) of the seven years, when there is a universal famine, “those who wander through the desert places, fleeing from the serpent’s face, will bend their knees to God.” Just after this, we read: “Then, when that necessity has covered over everyone everywhere, just and impious, the just, so that they might be tested by their Lord, but the impious, that they might be condemned for eternity with their author the devil … he sends them consolatory preaching through his servants, Enoch and Elijah.” (9) And of course, the sign of the Son of Man will then appear and Christ will return “with the whole chorus of the saints,” the Antichrist and his followers will be destroyed, “but the just will inherit eternal life with the Lord for the age of ages” (10). There is also a likely reference (5), in a much-confused passage, to the handing over of the “empire of the Christians” to God the Father; I see nothing here, however, to tie in with the earlier “rapture” passage, nor any explicit Millennialism. Is it not inconsistent to speak of the presence of the just and of God-worshipers after the “taking up” or “reception” of Christians to God? As far as I can see from Caspari’s quotations and my own consultation of the Greek texts parallel to the quotation in 4 (available, in Assemani’s edition, at Internet Archive and Hathi Trust, as you doubtless know), Ephraem Graecus speaks only of the “gathering together” of the elect. The proximity, in both Latin and Greek, of references to angels equipped with sickles implies, I think, a link to the parable of wheat and tares, which speaks of the “gathering together” of God’s people in the final harvest (Matt. 13:30, τὸν δὲ σῖτον συναγάγετε εἰς τὴν ἀποθήκην μου). Both the Latin and the Greek texts could (I suspect) be referring simply to the deaths of the elect–the Greek possibly also to some “gathering together” on Earth. You would need a fuller study of “rapture” ideas in Christian antiquity to be sure (and of Patristic commentaries on Amos 5:18, which is quoted in the text I’ve elided in ellipses in 2). I’d be surprised if nothing had been written, at least on a popular level. In any case, the Latin writer makes no attempt that I can see to reconcile the rapture-like language of 2 with the references to the just later on. He neither explains where the event fits chronologically nor suggests anything like the proliferation of post-rapture converts in the Left Behind series (I wonder whether such an idea would even occur to a writer with a concrete and institutional view of the Church, as ancient Christians often had). The whole text strikes me as rather muddled, and cobbling together material not just from Ephraem Graecus, but from the Apocalypse of Pseudo-Methodius, as Caspari documents. Perhaps the writer simply wasn’t very consistent in his view of the last things? A long comment, I know, and I hope you don’t find it tiresome. All this is to say: it will be very interesting to see what you find out. Thank you very much for this. Which Ephraim Graecus texts did you look at? That bit I have not yet got to. The Latin of De beatitudine certainly contains the exact same wording. My guess is that ps.Ephraem Latinus is cobbled together from all sorts of bits *in Latin*. These are then dependent on something or other in Greek, and the texts we have of this are also a mess. I’m having to do way too much work on this, getting straight what we have. The last of the Makarismoi and one of the sermons on the end of the world; I forget the lengthy Greek title, but all the Greek prototypes are cited in full, with page numbers in Assemani, by Caspari before he lists off the parallel texts (so somewhere around p. 443 to 445 of the volume I linked). By the way, have you read Caspari’s discussion? He has, I think, already trodden a lot of the ground you are reworking, raising (in particular) the possibility of various antecedent sources, the question of date (around the reign of Justin II, he thinks), and the relationship to Ephraem Graecus in particular. Thank you for that. I know it’s in there somewhere, but if you had it at the tip of your tongue, I thought I’d ask. I’ve got to do a post specifically on these points. I’ve only scanned Caspari at the moment, as German isn’t one of my better languages. It will all get done – I’ve been away, but collecting materials while doing so. MG somehow jolted me into wondering whether Patristic discussions (and apocryphal uses) of St. Matthew 27:52-53 are of any relevance, here? “I wonder whether such an idea would even occur to a writer with a concrete and institutional view of the Church, as ancient Christians often had”: I wonder if the work of Ilaria L. E. Ramelli (only some of which is slightly known to me) might be relevant, here? 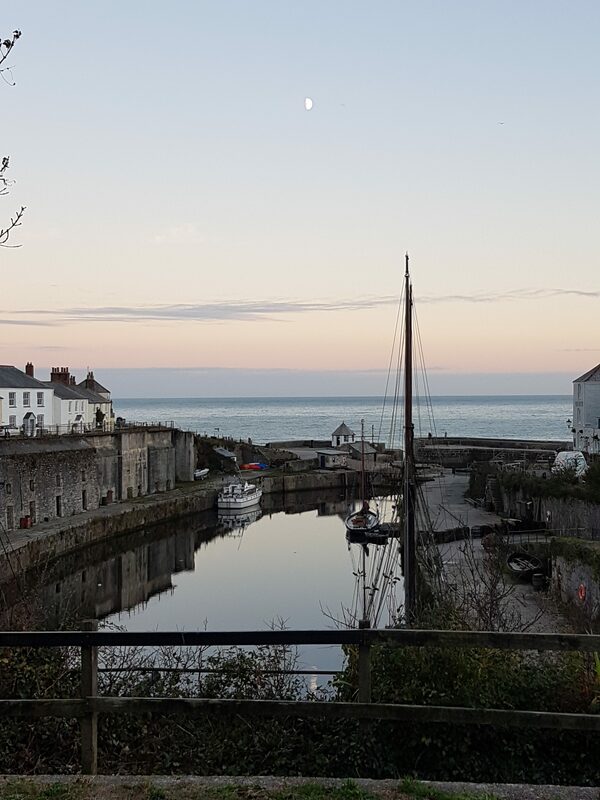 The only infliction of the snaps is of pangs of longing (related or not to regret for never yet visiting Cornwall) – thanks! Considering that “tribulation” is usually a synonym for “religious persecution of Christians” in most of the Revelation commentaries from back in the day, Ephraim Latinus seems awfully optimistic. Maybe it’s a reinterpretation along the lines that God starts allowing the worldly rulers to start persecuting Jews and other non-Christians, as a temporal punishment? Re: converts, obviously there wouldn’t be much institution left after a Rapture-type situation; but anybody can baptize and be baptized. Possibly Ephraim is envisioning a spontaneous conversion and self-baptism of the Jewish people?